Wes is interviewed by the great French director and Criterion labelmate Arnaud Desplechin in this month’s Interview magazine. They touch on Paris, Proust, the Movies and working on Fantastic Mr. Fox. It’s really terrific. Full interview after the break and at their website. This year, however, the 40-year-old Anderson seems to have given the slip to his frequent playmates—at least in bodily form—by swapping human actors for puppets and the concrete world for an imaginary one in his latest effort, Fantastic Mr. Fox. The film, due out in November, is a stop-motion animated adaptation of the Roald Dahl book about a family of foxes that is besieged by a group of angry farmers and forced to outmaneuver them in order to survive. Anderson tapped some of his usual collaborators—along with George Clooney, Meryl Streep, and Jarvis Cocker—to record the dialogue. 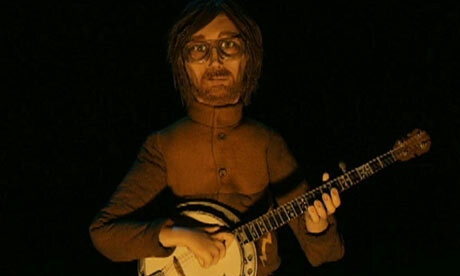 He then used those vocal tracks to inspire a mesmeric fantasyland of puppet performances brought to life by a team of animators on an elaborate soundstage in London. Fantastic Mr. Foxcertainly marks a departure for Anderson. French filmmaker Arnaud Desplechin recently sat down with Anderson at the Cinéma du Panthéon in Paris—one of the city’s oldest movie theaters—to discuss the ever-evolving architecture of Anderson’s idiosyncratic universe. Includes photos from The Gap on Regent Street courtesy of jazzt. All photos copyright their respective owners. George and Wes – what was the appeal of Fantastic Mr Fox? Why did you want to work on a film, particularly a stop-motion animation, based on that book? WA: Well, we all grew up with Roald Dahl’s writing. Fantastic Mr Fox was the first book I owned, so it made an impression upon me. I always wanted to adapt the book as stop-motion, using puppets with fur, because there’s something sort of magical about that. GC: I just did it for the paycheck. The money. [Laughs] But it was also the chance to work with Wes, which really appealed to me. George, in what ways do you identify with the character of Mr Fox? What did you think of him as a fox? GC: What I thought of him…as a fox? [Laughs] Well, he’s an optimist, which was really fun to play. I had a lot of fun on the film, working with such a great cast. I didn’t enjoy working with Bill, though. There was a lot of hatred there at first. We’re okay now, though. Some video. A bit more. Cocker voices Petey, one of the few human characters, his role the result of meeting director Anderson when DJing with Pulp bassist Steve Mackey in Paris at the wrap party for Sofia Coppola’s Marie Antoinette. “When he’d written the script, he’d also written the words for this song and he asked if I’d do the music for it. Which was quite nice for me ’cause usually when I get asked to do things it’s the other way round – they want me to do the words.” Cocker discounts his previous film appearance, as part of band the Wyrd Sisters in Harry Potter and the Goblet of Fire, as “more like prancing around on stage”. Early versions of Fantastic Mr Fox cast him as an onscreen narrator but US test audiences were baffled. “I may turn up as a DVD extra in the future,” he opines. We excitedly present the soundtrack listing for Fantastic Mr. Fox, available October 12 in the U.K. and November 3 in the U.S. The commercial ‘track includes one (original) Jarvis Cocker song, the obligatory Rolling Stones lick (“Street Fighting Man”), and three songs by Burl Ives. Discuss it at the Yankee Races forum! And here’s Fox composer and voice actor Jarvis Cocker on last night’s Late Night with Jimmy Fallon.